Charo Santos-Concio leads DZMM’s TLC clinic and classroom on wheels. 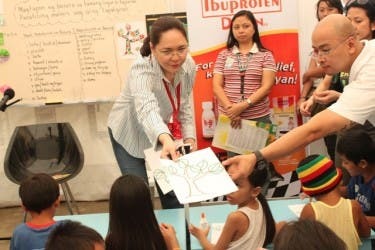 Telling a story is nothing new to ABS-CBN President Charo Santos-Concio, the host of the 19-year-old drama anthology “Maalaala Mo Kaya.” But last Saturday (Nov 6), Charo got to experience a different kind of storytelling as a volunteer in DZMM’s Teaching Learning Caring (TLC) clinic-on-wheels and classroom-on-wheels project. While people lined up for free medical check-ups at the clinic-on-wheels, Santos-Concio played teacher to 30 children aged six to eleven in a tent beside the classroom-on-wheels. After reading a book, she led a discussion among the kids, some of which have never set foot on a school. They were very participative, and she was touched by this. “Nakikita mo sa mga mata nila they’re very focused and attentive. There’s the hunger for knowledge. Nakakataba ng puso na mabigyan sila ng pagkakataong matuto,” she recounted. 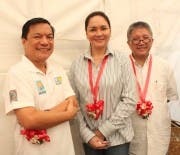 Santos-Concio, together with ABS-CBN Manila Radio Division Head Peter Musngi, and DZMM anchors Ted Failon, Ariel Ureta, and Bernadette Sembrano were in Angono, Rizal that time with a group of volunteer doctors and teachers for the very first outing of DZMM TLC. DZMM TLC aims to promote health and spark the children’s interest in learning in areas devastated by Typhoon Ondoy, like Angono. A product of the ingenuity and hard work of the men and women of DZMM, TLC is a spin-off of ‘Kapamilya, Shower Na,’ a mobile shower for typhoon victims conceptualized by Failon last year. The outpouring support from ‘Kapamilya, Shower Na’ donors paved the way for the construction of TLC’s clinic-on-wheels and classroom-on-wheels. “Kakaiba ito dahil dati rati sinasabihan natin sa publiko na pumunta sa ABS-CBN Foundation o DZMM Public Service Center. Pero napagisip-isip namin na marami pa tayong puwedeng gawin. Mayroon tayong mga truck, clinic at classroom on wheels na puwede nating dalhin kung nasaan mismo yung mga nangangailangan,” Musngi explained. DZMM has partnered with doctor societies and hospitals for the free medical consultations for up to 300 residents per area visited, and publishing houses and bookstores for the books and storytellers for the classroom-on-wheels. Aside from these activities, there will also be film showings, talks, and a soup kitchen-style feeding program in every TLC outing. Santos-Concio said the support of DZMM for these communities won’t end with every trip. “We hope to involve the local government para maipagpatuloy ‘yung ginagawa natin. Kaya ineengganyo ko ang mga volunteer teachers and doctors to take part in DZMM TLC,” she said. Musngi added that DZMM will conduct training for barangay leaders and turnover educational toys and books to them so they may continue imparting care and knowledge after the DZMM TLC caravan has taken off. He said the clinic-on-wheels may also be used to respond to emergencies. Failon said he hopes other groups will be inspired by the idea behind TLC. “Ito ay isang program na dapat gayahin sa anumang panig ng bansa para maabot maski ang mga mamamayan sa liblib na pook,” said the “Tambalang Failon at Webb” anchor. Meanwhile, DZMM also posted a 27% audience share in Mega Manila for the month of September based on the 2010 Nielsen Mega Manila RAM to continue its rule as the number one AM radio station. You can take part in DZMM TLC by donating useable children’s book for all ages, school supplies, toiletries, medicines, and educational toys. Just bring them to the Public Service Center at G/F of the ABS-CBN Foundation Bldg., Mother Ignacia Ave. Diliman, Quezon City from Monday to Friday, 10am to 4pm. For more information, just call Zaldy Naguit at 9244101 o 9244122 loc. 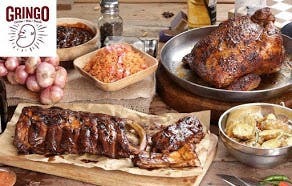 5674. Stay tuned to DZMM Radyo Patrol 630 and DZMM TeleRadyo at SkyCable channel 26. 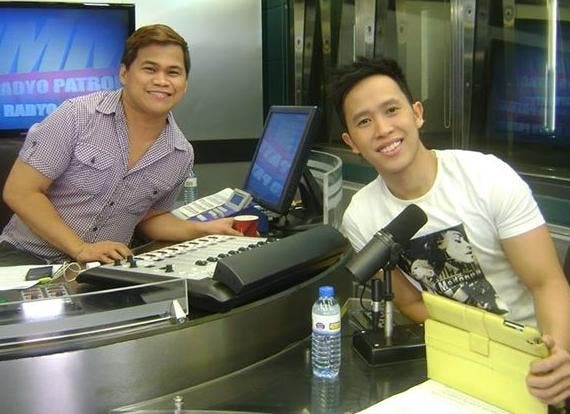 You may also visit www.dzmm.com.ph for news updates and live streaming. good deeds! keep it up. win na win ka maam charo! Hindi talaga kami nagsisisi na kayo ang president ng ABS. Umaasa akong lalo pang gumanda ang mga program ng ABS-CBN. like it ma’am charo!! good deeds!